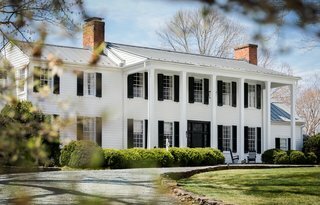 After a thoughtful remodel, a boutique hotel outside of Charlottesville, Virginia, is now inviting guests to embrace its luxurious dosage of Southern charm. There is no doubt The Clifton has had a fascinating past. 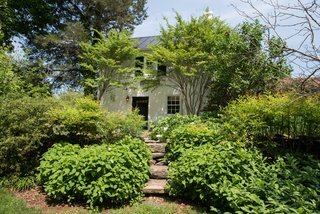 Originally built in 1799, the historic 100-acre estate once belonged to Thomas Jefferson’s son-in-law, Thomas Mann Randolph Jr. Husband to Jefferson’s oldest daughter, Martha, Randolph was a senator, delegate, and governor of Virginia, and used the land as an outpost for trade up and down the Rivanna River. Since the mid-1980s, the 1,850-square-foot historic building has operated as the acclaimed inn, The Clifton. Due to a recent change of ownership, however, the interiors have been beautifully revamped by Blackberry Farm Design to give the space a more contemporary aesthetic. 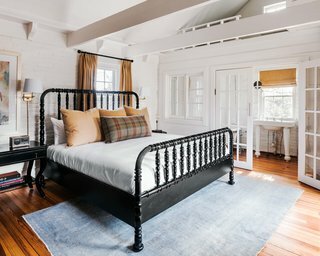 After a change of ownership, the historic inn was shut down temporarily for a cosmetic refresh by Blackberry Farm Design. The inn was originally decorated in a neutral color scheme with pops of gold and traditional furnishings. "[It] actually was a great clean slate for us to refresh," explains the Tennessee–based design firm. 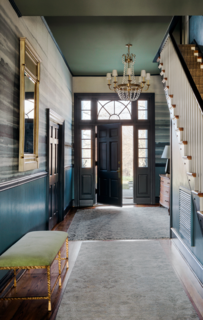 The walls throughout The Clifton were painted in Farrow & Ball’s Stone Blue, and the trim was gussied up with the complementary shade of Stiffkey Blue by Farrow & Ball. The structural bones of the inn were left intact, but the 20 guest rooms and main living spaces throughout were refreshed with new wallpaper, paint, and artwork, along with modern light fixtures and furnishings. 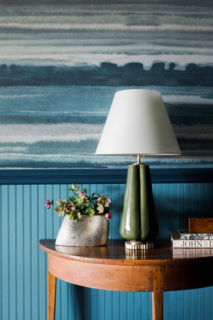 In the foyer, Phillip Jeffries’ tranquil blue Fade Sea Spray wallpaper gives a subtle nod to the nearby Blue Ridge Mountains, which guests have views of from the property. "We focused on a balance between modern and traditional in every space," notes the team at Blackberry Farm Design. "We chose a classic chesterfield sofa covered in a green velvet for an unexpected punch of color. The printed fabrics throughout have a traditional pattern in a lively, colorful way. 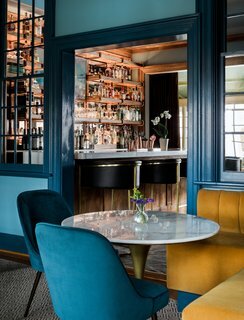 We placed vintage prints in the bar, mixing them with a large contemporary painting." 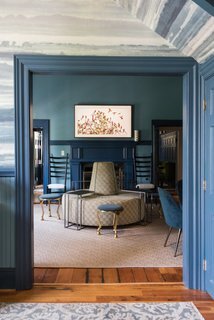 Off the foyer, what was originally the check-in area for guests was turned into a swanky lounge, featuring a round "sociable sofa," upholstered in Kravet Verbier Diamond fabric in Leaf/Teal. In the lounge, banquettes are upholstered in Lee Jofa’s Saranac Cord fabric in gold. 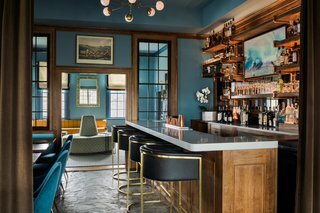 The most hands-on part of the inn’s facelift happened in the bar and adjacent lounge area, where the front desk was removed and the bar was elongated. A new bar-back was constructed out of wood shelving and supported by copper piping. 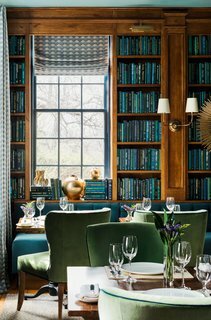 In the Library, built-in bookcases and a long banquette (upholstered in Kravet’s Versailles Velvet fabric, color E25600) were installed on the far side of the room. Before the inn opened in 1985, the veranda was an open-air front porch, with guests arriving from the river side of the property. However, in 1985 the porch was enclosed and the back of the house became the entrance. The veranda is the most popular place to dine at The Clifton, thanks to its large windows overlooking the lush back lawn. 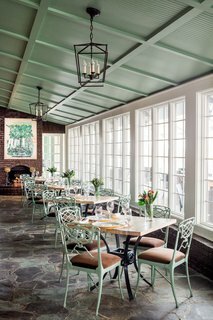 Blackberry Farm Design freshened up the space by painting the coffered-bead board ceilings and the wrought iron chairs in a soft green. The team also infused new light fixtures throughout. On the second floor of the inn, the six bedrooms were refreshed with new paint, light fixtures, and furnishings. 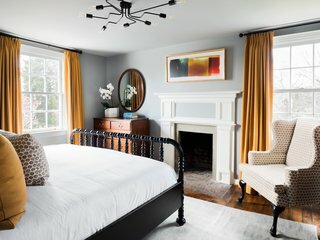 Some of The Clifton’s original furnishings—like rustic pine demitasse tables in the foyer, along with an armoire and the bedside tables in the guest suites—were kept and paired with more modern pieces. 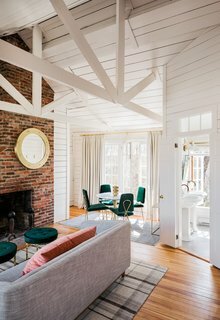 The original carriage house was transformed into a bridal suite that now has three guest rooms. Inside, large windows and vaulted ceilings create a bright and cheery atmosphere. 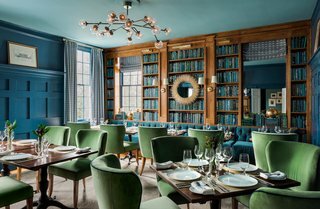 "We felt that keeping some of the antique pieces that had been at the inn for many years created a sense of character to The Clifton," adds the team. The neighboring garden cottage originally was Randolph’s law office. 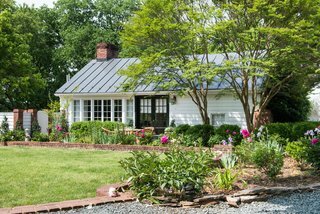 This space shares a garden with the old carriage house. "The arrangement of furniture is comfortable and traditional to preserve the feel of a historical inn. Meanwhile, the introduction of pops of color, modern textures, and style creates a more unpredictable look," continues the firm. Inside the cottage are two bedrooms that have been updated with crisp white paint, new linens, and light fixtures. 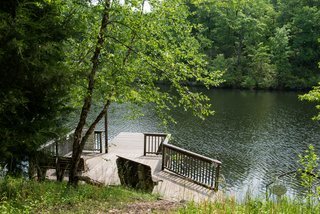 A stone’s throw from the main inn is the 20-acre Arabella Lake and the old livery, which is now outfitted with three guest suites that have private patios overlooking the water. 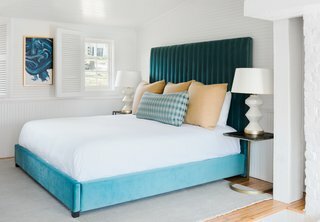 Guest suites in the livery include cozy living areas and king-size beds that are upholstered in a rich turquoise velvet. A quick walk from the inn and cottages, the infinity pool and cabanas offer a quiet place to sunbath and relax. 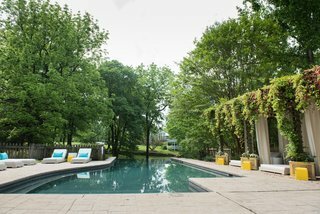 Learn more about The Clifton and/or book your stay via the company website.